Signs of beloved mission style are all over the Amish American Mission Bar Stools. Simple and strong with mission slatwork on the sides of the base and incorporated into the bar stool back, these wood bar stools make a beautiful presentation. 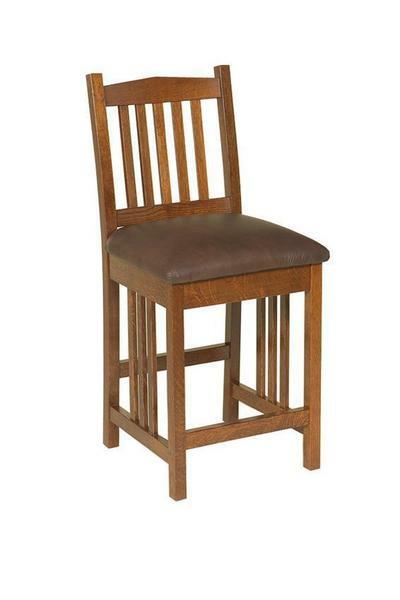 Bar stools at the kitchen counter or bar dress up casual dining, saving you from setting the table every night. Our wood bar stools are custom made in the wood and finish you like best and we're happy to provide samples you can look over to find the best match for your kitchen. Amish furniture will last longer, perform better and best of all, it's handcrafted in the options you pick. Email or call us today to speak with an Amish Furniture Specialist who can guide you through custom options. Thank you for shopping DutchCrafters for your kitchen.